NASHVILLE, Tenn. – Isaiah Joe made 3-pointers on back-to-back possessions in the second half to become the school’s single-season leader, now with 104, while Daniel Gafford scored a game-high 20 points to lead Arkansas to an 84-48 victory at Vanderbilt Wednesday night at Memorial Gymnasium. Joe broke the mark current Razorback assistant coach Scotty Thurman set in 1995 with 102 3-pointers. Joe also ranks second on the SEC single-season list for 3’s made by a freshman (Kentucky’s Jamal Murray owns the record with 113 in 2016) and Joe only needs five more 3’s to enter the NCAA all-time top six for 3-pointers made in a season by a freshman. The 36-point win ties for the second-largest margin of victory by the Razorbacks versus an SEC opponent. (Arkansas defeated Auburn by 36, 95-59, in 2005.) Also, with the win, Arkansas secures a first-round bye at next week’s SEC Tournament. The final seeding will not be determined until the regular-season concludes on Saturday. The Razorbacks were down 10 early (15-5), but outscored Vanderbilt a 23-4, including a 16-0 run, to lead by as many as nine points. Vanderbilt closed the first half with a 6-1 run and the Razorbacks took a 29-25 lead into the break. To start the second half, Arkansas scored the first nine points of the period as part of a 25-4 run to put the game out of reach. Arkansas dominated every stat line in the second half, shooting 65.6 percent (30-of-57) from the field, shooting 80 percent (8-of-10) from 3-point range and committing just one turnover versus 13 for the Commodores. Vanderbilt had its worst shooting performance this season. Overall, the Commodores went 17 minutes, 35 seconds between field goals and shot a season-low 29.6 percent. In addition to Gafford’s 20 points, Mason Jones scored 16 off the bench with six rebounds, five assists and three steals. Joe, who battled foul trouble, finished with 12 points and Desi Sills scored 11. Aaron Nesmith was the only Commodore in double figures, scoring 11 on 2-of-14 shooting. Arkansas wraps the 2018-19 regular-season by hosting Alabama on Saturday (March 9). Tip-off at Bud Walton Arena is set for 5 pm. Down 10 (15-5) with 13:17 left in the first half, Arkansas went on a 23-4 run to take a 28-19 lead with 3:36 left. • A part of that 23-4 run, Arkansas had a 16-0 run while Vandy missed 12 straight shots and committed six turnovers over 6:37. Vandy’s drought ended when Aaron Nesmith made two free throws at 3:35. Daniel Gafford and Mason Jones each scored seven points during the 23-4 run. 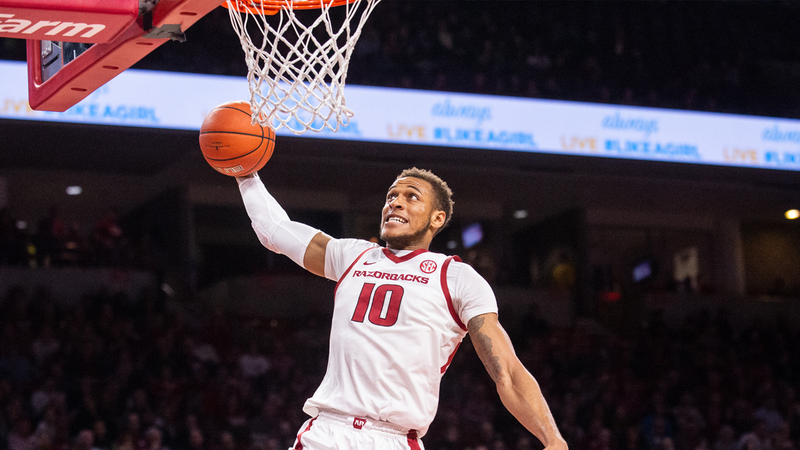 Daniel Gafford led the Razorbacks with nine points, Mason Jones added seven. Daniel Gafford and Mason Jones kept it going to start the second half with a 9-0 Razorback run, Jones scoring five and Gafford four, to give Arkansas a 13-point lead, 38-25, to start the period. Arkansas started the second half with a 17-4 run for a 46-29 lead at 11:40 (second media timeout). The run extended to 25-4 – when Daniel Gafford threw down a windmill dunk on a fastbreak with 9:12 left – for a 25-point lead (54-29). Through the first 13 minutes of the second half, Arkansas committed zero turnovers to Vandy’s 10. Isaiah Joe tied the school record with a deep 3-pointer from the top of the key at the 6:57 mark, giving him 102 for the season. (Scotty Thurman had 102 in 1995). On the next possession, Joe broke the mark at the 6:27 mark from the left corner with his 103rd at the season. At 3:34, Joe made his third straight triple to give him 104. Arkansas’ starters were Desi Sills (G) – Isaiah Joe (G) – Jalen Harris (G) – Daniel Gafford (F) – Gabe Osabuohien (F). It is the fourth straight game for this lineup. This also marks the fourth career starts for Sills and Osabuohien. Joe, Harris and Gafford have started all 30 games this season. Vanderbilt controlled the tip. Vanderbilt’s Joe Toye scored the first points, a 3-pointer at the 18:34 mark. Arkansas’ first points was a 3-pointer by Isaiah Joe at 16:41. This was the 39th all-time meeting between Arkansas and Vanderbilt as well as the second this season. Arkansas won the previous meeting, 69-66, and has won eight of the last nine Overall, Arkansas leads 26-12. The Arkansas record for largest margin of victory in an SEC game is 57 points when the Razorbacks defeated Mississippi State, 115-58, in 1993. The Razorbacks scored 55 in the second half. This was the second time Arkansas has scored over 50 points in the second half this season. Arkansas scored 53 in a loss at Tennessee in January. Arkansas shot 61.1 percent (11-of-18) from 3-point. It was the first time since Jan. 9, 2016 (Mississippi State) the Razorbacks shot over 60 percent from 3-point range. Arkansas forced 23 turnovers, marking the ninth time the Razorbacks have forced 20-plus in a game this season. Arkansas is second in the SEC by forcing 504 turnovers this season. On the flip side and for the ninth time in the last 11 games, Arkansas committed 15 or fewer turnovers – finishing with 11 at Vandy. This was the 19th tie Isaiah Joe has made at least three 3-pointers in a game. Jonathan Holmes hit a 3-pointer with 24 seconds left for his first points of the season. Ty Stevens also scored his first points of the season when he converted an old-fashion, 3-point play with 45 seconds left. This was the ninth time this season Mason Jones had led the team in assists, handing out five. Jones tied his career high with three steals. Arkansas took at least one charge for the 18th straight game. Isaiah Joe took his team-leading 24th and Gabe Osabuohien took his 22nd, which ranks second on the team. Gabe Osabuohien had seven rebounds, one off his career high. Jalen Harris only committed one turnover. It was the 15th time he has committed one or less this season (7 with zero and 8 with one). Desi Sills tied a season-high by making three 3-pointers.